Alexander Nevsky was a Russian prince from the 1200s. (Although, obviously, the area wasn't called Russia yet!) He was basically the go-to guy for defending his town's sanctity and booting out anyone who tried to invade. Monguls, Swedes, Germans... he kicked everyone's tail largely by having an incredible latent talent for military strategy. He did such a good job, in fact, that one of the other nearby towns enlisted his help for an oncoming invasion of the "warrior monks" known as the Livonian Knights. He kicked their tails pretty solidly, drowning many of them in a frozen lake. He was a local hero and Nevsky's life literally became the stuff of legend. Fast forward to the late 1930s. Adolf Hitler had risen to power in Germany, and Joseph Stalin was getting concerned the Nazis were going to invade the Soviet Union. Director Sergei Eisenstein was tapped to tell part of Nevsky's tale as a direct allegory for the commoners of the Soviet Union. That is, as the Livonian Knights came from what was had become Germany and Nevsky was from what had become the Soviet Union; it would be easy to draw parallels between Nevsky's battle and a possible impending one with Hitler's forces. Basically, it was Soviet propaganda borrowing a historical metaphor. When the film finally saw widespread release in 1941 (as Hitler was in fact invading) and was popularly received. Although the film's origins are decidedly political in nature, Eisenstein's skills as a film-maker were top notch and the movie continues to be hailed as one of the world's finest pieces of cinema. On to the 21st century. 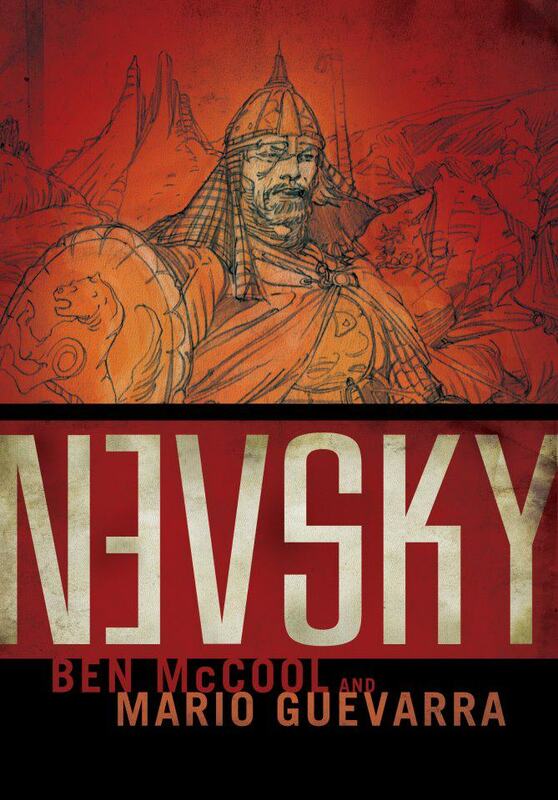 Ben McCool and Mario Guevara have put together a graphic novel based on Eisenstein's film. Titled simply Nevsky, it follows the movie, even picking up the sub-plots and costume designs. At least, that's what I've been able to discern. I haven't actually seen the movie, but I did some research on the film, after reading a review copy of the book, and saw the same elements in both. So I can't say exactly how closely the two mirror each other, but it sounds closer than some movie adaptations I've read. All that said, I was mainly interested in Nevsky from the historical perspective. You may find this shocking, but I know very little about 13th century Russia. So I wanted to see all the cultural aspects of the era -- social mores, clothing, weaponry, climate, etc. On that front, I was not disappointed. Despite being largely about a military battle, there's plenty in the book to look at all those things from McCool's handling of characters to Guevara's renderings. The story flows very well overall. I did have a bit of an issue following the place names, but that's my own problem. I have a tendency to shoot past unfamiliar proper names, and I had to force myself to stop and focus on the slavic locations. Everything was clearly identified; I just didn't read those bits. The one other issue I had was in Nevsky's ultimate strategy that allowed him to win against the crusaders. I'm not sure where the issue was here. I go the basic gist of his having a strategy to counter the counter-strategy that the Knights were using against Nevsky's original strategy, but I couldn't suss out exactly what that was. But I don't know if that was something missing in the writing, the art, or that I just don't have a head for military strategy in the first place. I suppose, though, that does highlight a strength of the book -- that there's enough information that you can follow the basic structure well enough even if you miss some of the specifics. I don't know military strategy, but I knew who was winning. One more note I'll make. Not a compliment or a complaint, but an observation. The book was a lot more graphic than I anticipated. Guevara did not make apologies for showing the atrocities of war. Plenty of blood-soaked bodies in the battles' wakes, and more than a few beheadings. It was quite clear that these battles were hard-fought; and there was no real "honor" or "glory" in battle, just a pragmatic focus on what needed to be done. It's a good book. Not one I'd recommend to everyone, certainly, but one which I can see a wide variety of people appreciating for a variety of different reasons. Retailing at $19.99, it's published by IDW and is out next week (I believe; I've seen conflicting release dates).